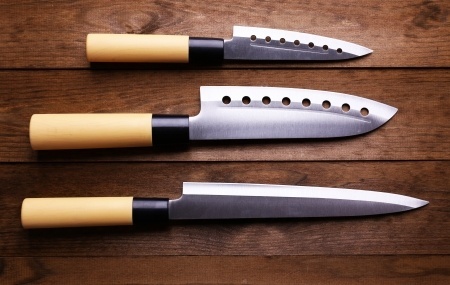 There are many ways of sharpening kitchen knives (chefs and butchers all have their own methods). Please take your time and don’t try to keep up to speed with your butcher; remember, he has been doing it for many years! Hold the steel firmly in your left hand, making sure your fingers and thumb are safely away behind the guard, and gently hold the handle of the knife in your right hand (or vice versa if you are left handed). Place your knife at the tip of your steel at approximately 45° to the steel, with the blade resting gently on the steel. Slowly allow the blade of the knife to slide along the length of the steel towards the handle, stopping just before the guard. Take the knife back to the tip of the steel and do exactly the same movement on the other side of the steel and the other side of the knife blade. Do these movements a few times and you will find that your knives always have a nice sharp edge to them. Always wipe your blade after using the steel to make sure that there are no small pieces of metal left on it.